For Omaha’s Saddle Hills neighborhood, dealing with the significant impacts of stormwater runoff has also created opportunities for community members to gain awareness and take stormwater management into their own hands. Not long after the neighborhood was built, a storm sewer was installed with the outfall at the edge of the neighborhood where it flowed into what used to be an old drainage way. The two properties downstream were developed and they, too, altered the drainage way. Runoff from the neighborhood eroded its own path through the first property, a church with an athletic field and playground, creating a very deep and wide “stream”. The stormwater flow continued onto the second property, a car sales lot, depositing eroded sediment and flowing across the parking lot on its way to a near-by culvert. The car lot’s owner reached out to an engineering firm in search of a solution to address the amounts of mud in his parking lot. 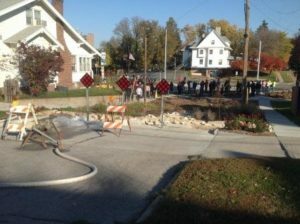 Discussions between the engineering firm, the City of Omaha, and the University of Nebraska-Lincoln led to the idea of using this project as a community example for improved stormwater management, rather than simply finding a remedy to the sediment deposition. In 2012, the University of Nebraska-Lincoln was awarded an EPA Urban Waters Small Grant to bring this living laboratory to life for two of Omaha’s watersheds while creating stormwater education opportunities for Omaha’s residents. In 2011, just before the University of Nebraska-Lincoln was awarded their Urban Waters Small Grant, 35% of Americans owned a smartphone. Today, 77% of Americans own smartphones. Technology has become increasingly more available and is now a critical component to many Americans’ everyday lives, especially the younger generations. The combination of GPS capabilities, web-based mapping tools, and the popularity of smartphones create the backbone for using mobile apps as an educational tool. Recognizing the promise of these new technologies, the University of Nebraska-Lincoln was awarded the grant in 2011 to develop two mobile apps as part of their stormwater outreach efforts. Because residents do not necessarily view stormwater as a pollutant, they are unaware of the negative effects it can have on their community. Education and awareness is critical to gain support from residents in order to make a positive behavior change. Residents who are supportive of proper stormwater management and the use of green infrastructure are more likely to adopt those practices and increase the chances for the project’s success. In the three years since the launch of the Omaha Green Infrastructure app, it has been downloaded over 100 times and viewed nearly 6,700 times. This educational app provides information on topics such as what stormwater is and why it is important and presents structural and non-structural strategies for managing stormwater. It also includes case studies of green infrastructure projects across the City of Omaha such as the Rockbrook Creek Tributary Rehabilitation project and the Florence Streetscape to connect app users to the various local examples of effective stormwater management strategies that can be found locally. The U.S. Green Infrastructure Reporter is a mobile application that can be used by citizens across the country to report green infrastructure initiatives, such as rain barrels, rain gardens, green roofs, and other green infrastructure industries. In addition to reporting green infrastructure practices, citizens and stakeholders can also learn about the different types of green infrastructure they may find in their communities under the ‘Education’ tab. The U.S. Green Infrastructure Reporter has collected over 7,000 reports nationally and 20 reports from the two living laboratory watersheds in Omaha. While these mobile apps have proven to be very useful, disseminating them has not been without its challenges. In addition, designing and launching a mobile app requires a significant investment of time for planning, programming and logistics, to ensure that the apps are user friendly and useful. 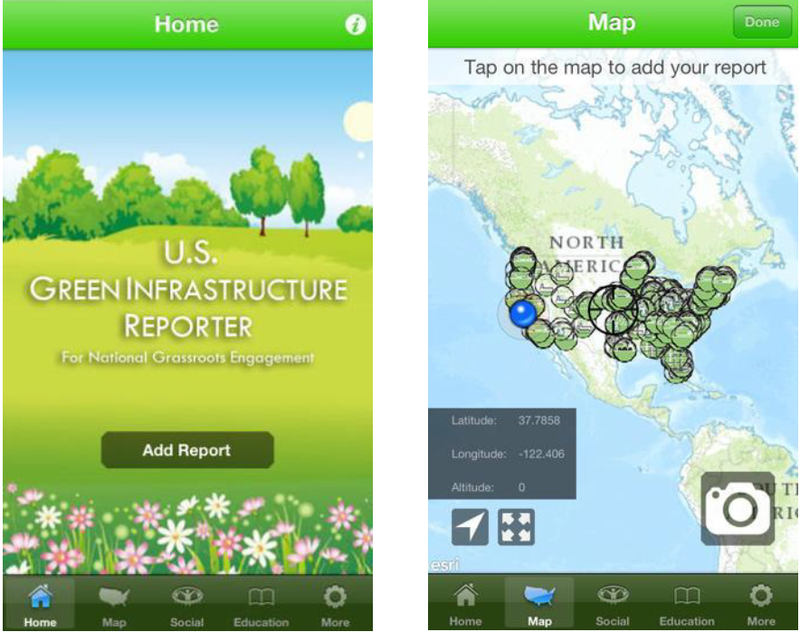 These apps are a fun, novel way for citizens to get out explore their local communities by finding and reporting green infrastructure initiatives and learning about stormwater management solutions. The mobile apps developed by this partnership are available for download in the Apple iTunes store or Google Play. The mobile apps were part of a larger community education and outreach project that the University of Nebraska- Lincoln and the City of Omaha implemented. They also used other approaches to engage members of the community, including reports, websites, providing incentives for survey participants, extensive use of social media, and hosting and/or participating in over twenty-seven events to increase local awareness of stormwater issues, such as green infrastructure tours and community discussions. Public education is vital to increasing local awareness of the impacts of stormwater runoff and to motivate positive change. This became clear to Andy Szatko, City of Omaha Stormwater Program Technician, after giving a public presentation. When a member of the audience came up to him to tell him they hated him, Szatko was taken aback, and asked why. The participant replied, “Now all I see is sand on the streets, erosion, pollution, (and) degraded streams.” Once people become aware of the issues, it is hard for them to “turn it off” and get it out of their heads. According to Andy, that is why community engagement is critical to managing stormwater effectively. To build on the success of the first Urban Waters project, the City of Omaha and University of Nebraska-Lincoln wanted to create an Omaha Green Infrastructure Education Network to continue to generate local momentum. They were awarded a second Urban Waters Small Grant to build the Omaha Green Infrastructure Education Network, which aims to provide education and outreach to Omaha’s underserved communities, the local workforce, and local schools. Through their partnerships, the City of Omaha and University of Nebraska-Lincoln recently completed a Green Infrastructure Education Resource Packet, a toolkit for integrating green infrastructure into the classrooms. It includes example lesson plans, maps of green infrastructure on or near schools, and tips and tricks for getting students involved by creating educational materials for schools. Materials and training opportunities for the local workforce are also being developed, along with targeted outreach to Omaha residents so they can adapt to the needs of the community. University of Nebraska-Lincoln and the City of Omaha are also trying to find ways to build upon the mobile apps they created as part of their first Urban Waters Small Grant and secure the resources and capacity to update them. The University of Nebraska-Lincoln was established on February 15, 1869 as a land-grant university, known for being the oldest in the state of Nebraska and largest in the University of Nebraska system. The university is accredited by the Higher Learning Commission of the North Central Association of Colleges and Schools.